SeaWorld Orlando announced details for Viva La Música. On Saturdays from April 13th through May 4th, you can visit SeaWorld and immerse yourself into Latin culture with sights, sounds, foods, and music – all of which is included with admission to SeaWorld Orlando. 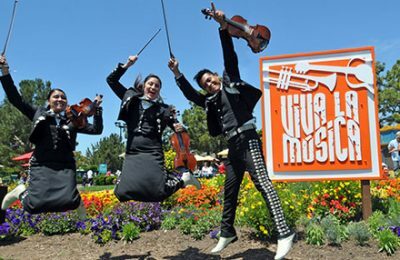 The Viva La Música festivities will begin at noon on Saturdays from April 13th through May 4th. At Viva La Musica, you can get a taste of many Latin foods including: arroz con gandules, arroz con pollo, habichuelas rojas y maduros, churrasco, ceviche, alcapurrias and bacalaítos. Executive Chef, Hector Colon, at SeaWorld Orlando will be preparing many of these dishes. You can also see live concerts from many internationally renowned artists. Concert seating is on a first-come, first-serve basis in the Bayside Stadium. However, SeaWorld does offer a Viva La Música VIP Package, starting at just $24. The package includes reserved seating to the concert and a meal (entrée and any one item from a selection of side salads, side dishes or desserts, plus a regular-sized non-alcoholic beverage) at any Viva La Música or SeaWorld cafeteria-style restaurant. SeaWorld also offers VIP seating for just $14. Click here to book your VIP package today. For more information about SeaWorld Orlando, visit the official website.